UAN Login: How to Login at UAN Member Portal Online? Today, an activated UAN is more or less a mandatory requirement for all EPF members. 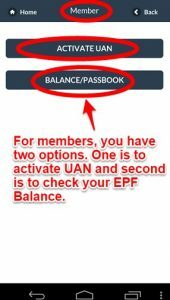 Therefore, it’s important to know how to get your UAN login activated so that you can avail all the EPF member facilities. In this article, we’ll shed more light on what the UAN is, and how you can register and activate it. UAN is stand as Universal Account Number. The UAN (Universal Account Number) was introduced by the EPFO to give a permanent identity to every EPF account. Subsequently, a separate UAN member portal was created to provide various UAN based facilities. The UAN initiative of the EPFO has largely turned the tables in favour of employees. With a permanent number related to the EPF account, employees can directly interact with their accounts online. Members can also avail various facilities without having to visit or send constant reminders to their regional EPFOs. One of the main benefits of the UAN login is the ability to club multiple PF accounts under one umbrella. A UAN also reduces an employee’s dependency on the employer for withdrawals. Moreover, it helps authorities curb defaulters. Other benefits of having an activated UAN have been outlined in a related article titled UAN Status. Having a UAN is critical for every employee, but how do you register and activate it? Without further delay, let’s look at the three ways in which you can register and activate your UAN login today. To get yourself registered and obtain UAN login credentials, first you need to get your universal account number. To know more about how to find out your UAN, read our article titled Know your UAN Status. For the online registration process, you will need your EPF member ID and mobile number. Below is the step-wise procedure for UAN login and activation. Open the UAN member portal in your browser. Click on Activate UAN as shown in the image. 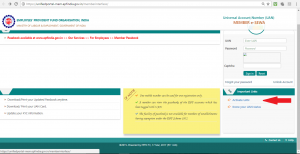 On the Member e-Sewa portal, a UAN activation form will appear. First, enter your UAN number. Click on the check box next to Enter Member Id. Select the State and Office in which your EPF account is maintained. The first 5 characters of your EPF member id are the Region Code and the PF Office code. The next (maximum) 7 characters are the Establishment Code. The next (maximum) 3 characters are the Extension code. The last (maximum) 7 characters are the Employee number. Refer the image below. Check the box next to Aadhaar to enter your Aadhaar number. Check the box next to PAN to enter your PAN. Enter your name (as it appears in your salary slip), your date of birth, mobile number and Email ID. Click on Get Authorization Pin. You will receive the Pin on your mobile for verification purpose. The UAN member portal is a major step towards EPF digitalization. We expect to have many other facilities extended on the EPFO portal. Therefore, it’s best to get familiar with it soon. 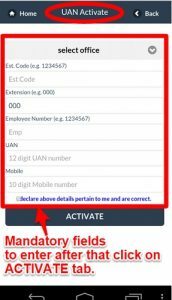 In addition to the member portal mentioned above, you can activate your UAN via EPFO’s mobile app. Here are the steps for activating the UAN via the mobile app. Before you proceed, however, you will need to download the app from the EPFO website. At present, the app is only available for the Android OS. On the main screen of the app, tap on Member. You should see two options: Activate UAN and Balance/Passbook. Tap on the Activate UAN tab. On the UAN activate screen, tap on the drop down arrow for select office. Select the office that maintains your EPF account. Enter the Establishment Code, Extension and your Employee number. These can be deduced from your EPF member id. Check step no. 4 under “UAN Login and Activation via Member Portal” above for more clarity. Enter your 12-digit UAN and mobile number. Tap the declaration check box and tap Activate. This would complete the UAN activation process. You can now avail the various facilities available, including checking your EPF balance and EPF passbook online. In order to activate your UAN via the SMS service, all you need to do is send an SMS to 7738299899. This method is particularly useful for those who do not (or are unable to) have access to computers and smartphones. To activate via SMS, send EPFOHO ACT,<<12 digit UAN number>>,<<22 digit MemberID>> from your mobile number to 7738299899. For example, if your UAN is 123456789876 and Member ID is XXYYY12345670007654321, then type EPFOHO ACT,123456789876,XXYYY12345670007654321. Note: there are no spaces before and after the comas in the SMS. If you are an EPF member, it is highly recommended that you get your UAN activated. UAN login is a major facility for employees because it enables employees to carry out significant EPF-related formalities on their own. The UAN number is valid till your membership is active, regardless of whether you change jobs. Visit our website often for all your EPF related issues. Whether you need to track PF status or check PF claim status, we’re here to help you find what you’re looking for. In addition, if the above information has been useful, please leave your comments in the box below. Many Thanks sir. This URL working. Looks like the online portal is not working and tried raising ticket via UAN helpdesk but unsuccessful. Hi can any share the website which is working for UAN actitation. I am trying to login to UAN e-sewa from past two month but the page never open neither the toll free number get connected.I am helpless . My Pf claim got rejected because I don’t have uAn card with me. Please help how can I download the UAN card, when website is not opening. Thanks a lot Bhsakar Ji, its working. Yes Very helpful link, but still some confusion that what happen with old UAN login page still not get load after 30mbps internet speed.. Which one is right platform for UAN login ? Mr bhaskar sir meru echina link use cheasnu uan activate ayyindhi. but i have to recieved a conformation password. how to get uan number please help please. very urgent please. Thanks for your information and one more query if i have two UAN NO. how i can merge both the UAN no. ?? Thank you very much for u r providing valuable link..
not working. is another URL available? why are uan activation .? is need employees uan activate from employer login? employer pay employees contribution is possible without uan numbers? why are actvate employees uan numbers from employer login? is a possible without active employess uan numbers from employer login for pay employee and emolyer monthly contributions? I have try to activate 10 days ago. But, again it is showing my register mobile. no. What can I do. please give my suggestion. Old UAN site is very good, this is NEW UAN SITE IS SHOWING SERVER DOWN. KINDLY HELP ME I WILL THANKFUL TO YOU AND OBLIGE. I Forget My UNA Password.How do change my password. I want to login my uan. I have two different UAN number how can i edit my father’s name & pl give reply what to do? Thank you for sharing useful details related to PF. Now I can activate my PF account. Dont worry Govt. site may be down sometime for maint. The Uanmember portal is not working from last 1 month pls help or provide the correct link..
it is indeed very good information for new members. I have a problem, i selected an option that i have two PF account numbers, but my previous employer did not provide me the PF account number , even upon request he did not provide me the PF number and now i can not see the statement of my UAN . System is asking me to attach the other PF account number which i was not provided by my previous employer. I am not able to access login page of uan for downloading my of balance…. http://uanmembers.epfoservices.in is not working since 5 days. Is there any alternative site address? Unfortunately, there is no other alternative website. not able to activate the UAN? This is to keep you posted that i have been trying to login in UAN portal through http://uanmembers.epfoservices.in/ to update my KYC information for last couple of days but unable to open that site. Can you please do the needful so that i can do the same as it is importent to me to update the same. I have to update my Adhaar No. to UAN, PAN and My bank details. once, twice & many times i tried but its can’t be success, always is shows “pending” as in status column. So pls make clear. My company getit infoservices askme.com . I resigned 10 july 2016 serve my notice period one month company was close 30th October2016 right now is court case running. All office clouse in India no body employ in system. so how can I withdrawal my PF amount . Enquiry to PF office but officer asking it’s not possible to withdrawal because no body is there to signing authority PF form to in ur company . Please help me how can i withdrawal my PF amount. If the employer will not sign on the PF withdrawl claim form of an employee, Gazetted officer has the authority to sign on the same. uan member portal site not open. so please request to you sir uan member portal site link send. Kya bole yaar..mere paas approved form ake para hai company se aur main mera membership card bhi download nahin kar sakta aah 5 din se website kaam hi nahin kar raha hai.Ye India main kisiko kisika para hi nahin hai.Ek essential website aaj 5 din o se kaam nahin kar raha hai aur koi authority ka koi khabar hi nahin….Lakhon karoro logon ka pareshani..aur ye logon ka kuch ata jata hi nahin hai.Abe kaun hai is website ka maintenance main..??? http://uanmembers.epfoservices.in is not working since 5 days. Agar alternative nahin hai to jhak marne ke liye engineer logon ko system main baithate hai..?? Am also not able to access UAN member portal. Please let me know when this site would be available. UAN member portal site was not working from last week on-wards. This help desk number is useless. i tried calling this number several times for last one month. it says busy all the time. even raised complain in portal. useless . We are applied PF claim on 11/11/2016,and claim dox received at your end confirmed by online,but now it self there is no online link/not respond through calling,pls do the needful. Someone ask to Mr. Arun Jaitely, Why EPFO(UAN Member) website not working since last week. Anyone looking from your team. Site is not working do you have any alternate site. Unable to login UAN member portal.. Is there any related link? please do needful , i need to update KYC info. Past 2 weeks UAN portal showing error. May i know when it will get resolve.? Muje pasbook download karna bahut jaruri h iske bina pf ka apply nahi kar sakta hu .or other no kaise ragisterd kare. I am pradeep kumar sahu, i am not able to download my UAN Card from last 25 days, and even Pf site is not working problem.. Please suggest me any particular site regarding UAN Card, and do the needful for me. Unable to login UAN member portal. It’s not working……. Uan Website not open for last few days why…? Ironny of Acche din, Digital india i am unable to understand what these leaders are doing when such a crucial website of UAN is not working since last one week and no one to take up. Sirf bhashano se baat nahi banegi. Haraamkhoro ko belt ke neeche hit karna hoga. Sir me Balram das mera pf avi tak nhi mila h me 6 bar Ranchi pf office jaa chuka Hu waha bola jaata h Ki Kuchh din baad mil jaayega mere sath aisa hi ho rha h akhir kab milega… ..
It’s showing network error . Site can’t reach. i have attached ma pan card. need to check activation status. and apply for PF. but unable to open the uan portal. kindly fix the issue asap. uan member portal is not been working for a few weeks in all the browsers. is it have anything different url???? I am trying to edit some of my profile details but unable to open the website from last 1 week. Is there something worng with the website? It keeps loading and loading from last 1 week. my mobile no. 9634124666 is not update in my epf account pls update this no asap. there is some problem on govt website so don’t worry they give 5 more days for filling….. I am unable to fillup Adhaar Card No saying that DOB not matching. Not access the website .. Please do something. Find the bug and fix it. PF ko to Bhool jao. Paisa govt ko dena is stupidity. Wapas mangna is bigger stupidity. Plz help mera UAN no. Message she delete ho gaya h to mughe vah no phir she kese milega??? sir we are finding the problem in accessing UAN portal Please help us..
EPF website is not loading from past 1 month.Could anyone from concerned dept let us know when it will be restored ? I forgot my uan password. I want to login my uan. I just cliked on forgot password button. there are a major problem i am facing through, Its giving me bold chatptcha code to ender. But its not possible to enter any chatpatcha code in bold fonts. I missed my password and registered mobile number. when i am going through forget password in uan portal. Its giving me bold and normal mixed font catpatcha code. But its not possible to enter any chaptcha code in bold font. Not able to access UAN website from approx a month. Sir mujhe paiso ki sakt jarurat hai. Mai bimar hun mujve mere pf acount se paise nikalne me meri helf kare mai kase paise nikal sakta hun. Plese helf me. I ‘ve a query, I have the UAN number from my current employer.But, unfortunately I don’t have for my previous employer and I’m looking to withdraw my previous employer PF. The mobile number which I have registered is delivering the message stating : mobile number is not registered with any UAN. Can you please look into this and do the needful. Me aapko batana chahta hu ki ess UAN Member Portal pe mera Name wronge ho gaya hai ( Patel Amir Ashif ) ye Apke Panel par show kar raha hai. but Actually my currect name is ( Patel Asif Amir ) Hai..
Plz any Reply your hend Sir…. Before posting any message or content, Kindly do research. UAN Website is not working for months, not just days. Please visit nearest office in the morning before lunch time. how is status in EPEFO side. I don’t have the uan password and want to update the phone no. Please give me any suggestion how can i start my pf withdraw procedure. The website is down for over a month now. There is no support from the EPF folks and the phone lines do not work. Looks like another scam in the making. I have been unable to register a compliant as well for over 15 days. uan member portal is not opening for epf status cheeking problem. koi to bata do uan login kaise kare. am trying to open UAN Member Portal but this is not visible on the website and I can not download my passbook and cannot know my pf balance and enquiry.last 8 week but not open .i request you to please make it corrrect because it iv very important of all PF Members.thanx. Trying to activate UAN number from last 20 Days but wesite is not working, i dont know what the hell they are doing from last 20 days, at least they would have mention website is in UNDER maintenance or something.. total URL blocked, is this is the first step to DIGITAL INDIA ? Myself, the undersigned, a member of EPS 95, has completed 58 years of age as of 22.08.2015 and since then made few unsuccessful attempts to submit my claim for superannuation as they got rejected for some trivial reasons. Finally, recently I submitted my claim form 10D for superannuation duly filled in in three sets along with original scheme certificates on 28th October, 2016 and the same was checked thoroughly and acknowledgement was also given for having accepted. But to my dismay I got a message on 25th November 2016, that the same is rejected for not sending scheme certificates in original and hence rejected. My humble submission to you Sir, is that I have actually enclosed 2 scheme certificates in original ( bearing numbers PY/PNY/00008479 and AP/HYD/00069848) in one of the 3 sets submitted and probably the processing officer at Delhi-south office may not have checked all the 3 sets together to locate my originals. I request you to use your good offices to prevail upon the concerned to locate my originals and return to me so that I can submit it again. I have only this option left for me now as by no way the concerned are approachable as I am working in Bangalore and you will agree I cannot reproduce my originals again. My Details for your reference and I also attach the acknowledged copy of my claim form. EPF Account Number DS NHP 937446 94.
for claim it always problem, shown by pf office of dehradun,uttrakhand. uan member portal site not open in google. Kindly use the new EMPLOYEES’ PROVIDENT FUND ORGANISATION INDIA. I could able to login using my UAN & Password. I want to check my pf status but your site is not working.. how long it will take to working fine..
Mujhe Apna uan number bnana jai.please help me. I want update kyc for withdraw pf amount. but uan portal website is not working from long time. kindly suggest me alternate of this or tell when it will work. may you please guide me how to get my uan number only with this number ((UPLKO/000405100A0000909.)) how to activate my uan number.. Thanks for providing new EPF website link. Iam having two UAN numbers, how can i map my old and new PF account to single UAN which is old UAN. My name is Babu , Im login past 20 days also not Opened UAN LOGIN Page ,,,,,plz Soltout……. who is the new site sir…….? UAN member portal site not opens in google since one 20 days. Please suggest how it will open. UAN member portal site not opens in google since a month. 2 months before i open the pass book – one year date is gone (Apr15 to Mar16) total also less. currently not open the link. please check and action for the one year date. who is the new site sir…. UAN Activation nahi ho raha hai sir ……..
UAN Link is not working. please try with this link . Last 1 month I tried to create uan number but website not working properly can you tell me when I expect working fine it’s then I tried to create account. UAN member portal site not opens since a month. HI I AM NOT ABLE TO LOG IN TO MY UAN & REST MY PASSWORD AS I HAVE TRIED TO RESENT UAN WEBSITE SEND OPT TO THE REGISTERED MOBILE NO I HAVE NOTICED THAT MY MOBILE WAS WRONGLY MENTION I TRIED TO CHANGE MY NO BUT AT THE END SIT HAS BEEN ASKED THE CORRECT MOBILE NUMBER & I HAVE GIVEN THE SAME BUT AT THE TIME I HAVE ENTERING THE OPT IT IS NOT ACCEPTING THE SAME PLEASE HELP ME WITH MY CONCERN. Last Month se apka portal open nahi ho raha hai mai apna A/C kaise check karu. Maine apna pf form bhar ke bhej diya hu fir bhi 5 month se mera paisa mere AC me nhi aya hai uske liye kya krna pdega . aur company wale bol rhe hai ki apka pf office me bhej diye hai fir bhi paisa AC me nhi aya hai uske liye kaya krna pdega . UAN portal is not working since 2 week on wards .We also know the problem what is happing in UAN portal group admin kindly give me solution for this issue…. when I try to login to the new url (https://unifiedportal-mem.epfindia.gov.in/memberinterface/), getting error “404 error-Blocked By GNOC TEAM, EPFO”..
my self manas ranjan mohanty,uan portal site not open.how check my pf balance please open a site. UAN MEMBER PORTAL SITE NOT WORKING. Its difficult to know our PF details. I have enter my UAN no and password but that capta filed i have enter correctly but error comes. Invalid capta. how to enter correct capta in PC. Your Site is not working since 1 Month. I was try so many time but site cant respond. How to get uan number from pf no.I need the UAN No .Couid you please help me. this UAN is Govt F* JUNK portal be careful. any one tell that from When UAN Link is will work ??? Please help me in withdrawing my PF in a simple way.As I am facing number of problems in logging in UAN and PF withdrawal.I am trying it from last 2 months. above mentioned website is not working what should i do to see my pf balance. mera nam pankaj Hai bohit din se try kar raha hu epfo member portal registration karne ka liye but…aapka diya hua URL-http://uanmembers.epfoservices.in/ kam nahi karta hai…dusra koi upai hai kiya epfo member portal registration karne ka liya…agar hai to plz help me…. UAN LINK IS NOT WORKING ,PLZ SUGGEST HOW IT WILL OPEN. i want to open pf login portal to update kyc but not going through. if it will take this much time than how people work. is there any other way to update kyc.pls help me. Hello, UAN Member Portal is not working since last one month. Please look into the same. I am not able to open the the account at your website/application. I have tried enough but cannot access into it . site not working , kindly resolve issue , as of india is going to be digital for this only to face issues like this. What IT tteam of India Doing. Kindly solve issue and confirm. Its been long time The site(http://uanmembers.epfoservices.in/) down. dear EPF dept’s already know that’s issue, but your’s not focus for this problem, so please clear with dept related officers…. my pf balance is showing less then it has to be . The company told me that they had deposited the actual amount but it is not reflecting in my PF account . I have written you so many e-mails but none response by ur side . team pls look into this matter , i am not able to activate my new UAN no. I want update kyc for withdraw pf amount. but uan portal website is not working from long time.I can’t upload my details. Is there is any other alternate way to upload my details.please help me..
UAN member portal site not opens in google since one 30 days. UAN no. & password of old link is not working in new link. I’m not able to find login site where I have to login plz give me link. PF 7237 UAN NO 100278662157.
uan meber portal site not working.why this problem shown in my computer can you guys help me? kindly give me working website.. Mere ko apne document KYC me upload Karna hai but site is not working so please suggest what can i do? Hlo sir, myself sandeep. mujhe job se resign diye 8 months aur pf ke documents bheje ko 1 month se jyada ho gya h par abhi tak meri payment nahi ayi h. maine pf withdrawal ke liye jruri sare documents bhej diye h. pls help me. UAN login site is not working from long back .Please provide us the information what is the problem. UAN portal is not working. what is the alternate solution? From too long days the UAN members portal is not working, Pls check & provide the necessary action for this issue that why it is not working. UAN portal is not working from past 2 months, Request you to check and resolve the issue as soon as possible. your pf site not working for last many days whats reason’s. plz answer me as soon as possible. Kindly solve this issue , UAN web sites are not working at the same time we are unable to upload our KYC documents from last 10 days. If we are going to PF office they are saying you consult employer… but without KYC documents uploading … PF office guys will not take . Pf withdraw Online form from us. kindly provide me the solution. How to apply for PF online without visiting employer or PF office,please help me here. uan member side login not working . Have been trying for a month and more now. no. 8130376860 is send to password. The website is not working since jan_17 http://uanmembers.epfoservices.in/, can any one help me out when will the website work properly so that i can view my account details. UAN login portal website is not working for the past 3 months. Also missed call alert not doesn’t have full amount details. The officials have to take necessary action to rectify the same. This is height of irresponsiveness of the Government of India? Why no action has been taken on this matter for 3 months? This is a fake site becouse it not proper work..
Its very creat hard issue and bad site. Before site is very good but new site is fake only fake. Site design is not good its bad site..
you could do right site and right rule by govt. Of india. hi what happen unfortunately uan website not working for last 3 months till now . Really it is hopeless.. no action till now.. It is very difficulty to open these site. if any our querry or to see the epfo a/c. So, UAN login portal website to easy opening the status of Epfo amount & transaction or submitting by Contractor/company. My date of birth wrong feeding by dept how can i edit my date of birth pl give reply what to do? I want to update KYC in my PF Account…but UAN member portal is not working for the last 2 Month…What is the alternative method to update KYC?. Sir…UNA site note open. I will see my pf amount please help me. UAN portal is not working properly. It is down most of the times. Unable to access the link for past 2 months. It is an urgent requirement to get my pf statement, but failed miserably to get it. Sir…UNA site note open. Please do something. I want to update KYC in my PF Account…but UAN member portal is not working for the last 3 Months…What is the alternative method to update KYC?. Give missed call to 01122901406 from registered mobile. It will msg you pf balance. password not fond pliz re send password. The site is not getting activated and unable to open and my settlement is not done by EPF department so far even after one month of all requisite papers. KR/TVM/. Regional Office is not acting fast hence this complaint. What the hell is going on with this PF website……….. that is what we called India. The UAN site not working . So please tell me how i am login in UAN Portal. It’s Urgent. Last 3 month se me mere Aadhar KYC ki detail upload nahi kar pa raha hu (adhar authentication ki error aa rahibhe). Helpdesk ne time diya tha usme b nai hua, website down he properly work nai kar rahi firbi koi dhyan nai de raha..koi management hi nai he. I want to update KYC in my PF Account…but UAN member portal is not working for the last 3.5 Months…What is the alternative method to update KYC?. I am unable to download UAN card kindly help me website is showing some error I am trying from last 1 month. Kindly check on the same. http://members.epfoservices.in/ website isn’t working since last 4 months almost. http://uanmembers.epfoservices.in/ ITS NOT WORKING . Unable to login uan portal, trying to update my kyc details from past 3months. Now my contract has been ended with my employer and I want to claim my pf. Please help me in this. Even mobile App also not working. so many people facing same problem….since last 3months uan site not working…. Hi, what a joke, i am unable to access details of my mon no response even at toll free number. Its a fraud with private sector employees by the PF Dept. They do not understand how we are earning this money as they just have to sit in rooms and sleeping all day. Hello sir/mam reply to krdo site kb chalegi ..??? on new portal when i go to chang my password it shows failed to change password.what will do it shows all the time same.. This is the new site.please check it..
My company is close & not aut. person till, please help me how to take my PF. UAN Portal not working, Is there any reason, any changes in port? kindly look on this matter at the earliest & oblige. Kindly let me know , How to change My Date of Birth in E – Pass Book?? Please login by using below link, its working for me. This site is not working and i have been trying to login for quite some time. I very recently received UAN no from my current employer in Bangalore. 5 years back I had 2 PF accounts with the same Bangalore PF office but they are inoperable now. I have not withdrawn the balance nor made any transactions for the past 5 years. I logged in with current UAN & see my current account. Can anyone guide me how to add those 2 accounts with the current UAN? in my UAN LOGIN PORTAL My pan memeber was wrong, how can i edit my correct PAN NO. UAN not working some months.. . I left my previous company 1 year back (completed 4.8 years of service). I am applying for PF withdrawal. Are their any interest applicable for accumulated PF and if yes, how much %? Already have UAN account with last company PF though my new company opened another UAN with new PF accnt rather than listing it new UAN. Please guide on how I can transfer existing PF to new UAN and how to deactivate the existing UAN now. 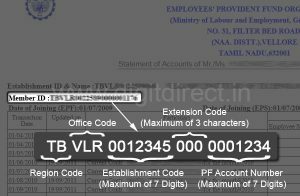 my previous company my epf account no is KN\BN:KN/26768/115 but i have not UAN .Now i am working another company so i have new pf number & UAN. SO how to get previous company UAN & pf balance transer to new pf account ? I am not satisfied with this beacuse whenever I tried to login me PF account the it takes me to the Google Ads page .From last one month I am facing this sort of problem. So I request please help me in my PF accounts.So that I can have end to problems. I have been trying this site from last one month, but it doesn’t work. Is there any issue going on in this site or PF Dept deliberately did this ? please help me in login or register my mobile number with my UAN number. whts its link not working ! why ? This site is not working and i have been trying to login for quite some time. so please pf details provide me my UAN no.100101948900 & kindly update my name. Link for UAN member portal is not working at all . I am suffering problem to check my pf balance.. And as my registered mobile number is not working, i cannot check it by sms too. I am not getting UAN login page can any one help me. My UAN no is 100111570238, I forgot my login password..also not using my registered mobile no 8116956363 any more. So am not being able to login in UAN portal. Can you please me help me out with a resolution. Contacted with UAN help desk 1800118005 they are saying we don’t have any option as of now to reset your password. Please help. i found this number as EPFO UAN Customer care number. . . But the number seams to be busy at all times. Any one suggest a solution to this website not working???? I am unable to open my PF ACCOUNT by UAN number.so please look into this and suggest next course of action…. Those who are not able to access below links for UAN and PF claim, be advised that the EPF department is currently under maintenance and they have informed the sites will be back and the ETA is March 31, 2017. UAN portal link error any one can help please ………………. uan web site not working why????????? what is the issue ????? Is any technical problem to this link? We are facing so many problems with your web site. Your online portal is not working from so many months. Now the question is, Are you really available any where & working or just you are fake? When we are calling on your toll free number, nobody is taking our call, as well as every time number is coming busy. What are you doing? Please give us explanations. Otherwise, we need to do RTI on you. Please kindly don’t play with all employees & start your web site. So all persons can able to check the balance as well as register the new one. Can some one tell me how to transfer my PF to my new company.Its been 4 months site is down.Where as the new site show only the pf balance.Can some on help me the procedure. what happen EPF passbook and balance is not downloading since long days. pl.arrange to load shortly. Can you please give the link to activate uan? what ll be the password to download passbook from below site? ?I ve already activated my UAN and password is showing wrong while logging in this website. uan site open nahi ho raha hai kya? Uan नाही मीलत सर ..password च येतोय. I am trying to view my passbook. i entered UAN no and password correctly. but its showing enter 12 digits uan no corrrectly. you are working too good and I get all information about an own little problem. Thanks for sharing a great knowledge with me and whole people. Dear sir , may uan active member Lost, I am changing may uan number please help me? Utpal, your UAN number cannot be changed. Please check with your employer. They will have it. Sanjay, You need to scan the Aadhaar card. Then, you need to upload this scanned copy. I got UAN number and password. But i am unable to view my PF status. Kindly advise me, how i proceed further. Ravindran, Have you activated your UAN? Most facilities are only available if you activate your UAN and update your KYC details. UAN login erro. plz help me for login…. UAN login error. plz help me? Sir my mobile no. 8804905667 is not working its new  & my UAN no. is 100465135841. Pls solve it sir. This site is of no use as I have been trying for past few days, but the site does not open at all. Its a waste of time. you will find there’s new feature generally known as Facebook cover photo located right over the profile right behind the key display picture. on the way home coming from a 5am recording session. when i activated uan no it shows dob does not match. and i have tried many times which is given documents. how i can activate uan no. My name is gudiya shyam lilani…. when i was updated my aadhar card they are showing me mismatch ( Name,dob,gender,aadhar number) What can i do please help me….. When i activated UAN no it shows not match any details and i have tried so many times which is given documents how i can activate UAN no.